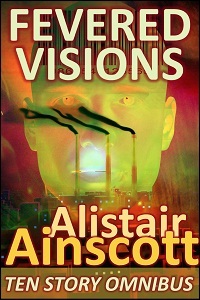 Professionally published writer Alistair Ainscott presents ten tales from the febrile hinterlands of reason. The stories probe shades of light and dark, from hilarity to shadows of doom. The light-hearted farce of a man trapped on a 3,000 mile trip with his twin toddlers. A mysterious forest fortified by concertina wire of black-barbed briars. One man’s quest to atone for nuclear holocaust. The stories have a variety of themes and inspirations, almost always modest extrapolations from the safe islands of everyday experience that somehow mushroom into farcical (or horrific) tales of characters in dire situations. Call it an expedition to a visionary present if you like, or an exile to the febrile hinterlands of reason if you must, but terrifying or farcical, there’s something strange and wondrous to engage the reader with each tale.